With more the seventy volcanoes, several of them active, Costa Rica is still a land in the making! Arenal and its thermal hot springs. Day 1: Early morning departure for the scenic drive to Arenal Volcano. 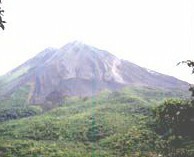 Guided hike to lookout in Arenal National Park. Tabacon Hot Springs. Overnight at Volcano Lodge. Lunch and dinner included. Day 2: Morning hike to spectacular Fortuna Falls. Lunch in Fortuna, return to San Jose. Breakfast and lunch included. 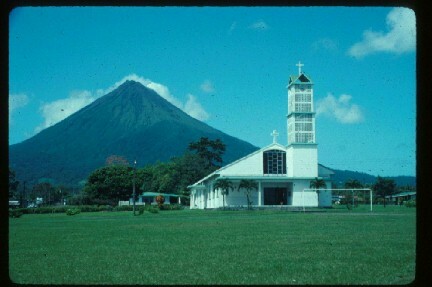 Variations on this tour allow two nights at Arenal (to increase viewing opportunities). You can also add horseback rides or hiking tours to the lakes, mountains, and caverns. Lake Arenal is the largest lake in Costa Rica and is noted for fishing and windsurfing. Transfers possible to Monteverde, Sarapiqui, and the Pacific beaches. 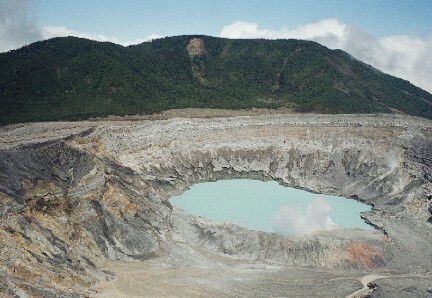 Poas Volcano, with its steaming crater and mountain forest, is a popular daytour from San Jose. We now offer it in combination with the magnificent waterfalls and stunning butterfly displays of La Paz Waterfall Gardens. With an early departure you can add Poas to the first day of the Arenal Overnight Tour. Our Costa Rica volcano programs are all personally hosted by Enrique Dodero, volcano aficionado and owner of Turismo Personalizado, a licensed Costa Rican tour operator. We firmly believe that no one knows Arenal better than Enrique!